Michal is dedicated to her client’s individual human evolution, which includes the development of their souls, their intuition and their capacity for joy and to love and be loved. Her work produces amazing personal, emotional, psychological and spiritual development. Michal has been an exceptional professional intuitive mentor for many years now, strictly following the path laid down for her by the teachings from the inner world that she was initially given in meditation in the early 1990s, and has continued to receive. There is no 'spin' here, and no lessons regurgitated from others - far from it. Michal is the real thing, and at the same time is humble and retiring. Michal’s previous professional role was, in complete contrast, as an accomplished current affairs national television reporter in the UK. 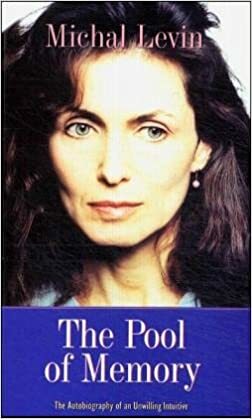 Michal tells the remarkable story of her transformation in her book ‘Pool of Memory: the Autobiography of an Unwilling Intuitive’; it is a profound, terrifying and inspirational tale. Since this transformation, Michal has integrated her unique spiritual experiences into her everyday world and work, developing her teachings from them. Over the years Michal has worked with a rich, diverse and international clientele from all walks of life. She has worked at Universities, including Notre Dame and Penn State University Hospital, and has spoken widely in both the USA and the UK. Her preference though, has always been to concentrate on her work and clients, not on building a (business) profile. Her focus now, after many years, is making her teaching as accessible as possible. Most people who work with Michal see her as a spiritual teacher with exceptional intuitive powers, others simply as someone who enables them to be and do more, to see and live in technicolour rather than in black and white. Michal’s teachings and material is rooted in the everyday – her emphasis is on walking the walk, rather than just talking about it. She is interested in all aspects of existence, and, above all, in creating real and lasting change. Whatever you are looking for, working with Michal and her teaching is a rich and unique experience. It will be unlike anything you may have tried before. Michal never offers ‘lowest common denominator teachings’ or ‘saleable packages’, but simply offers what she is, and that is extraordinary.